Steel keepers and steel chain secures door while allowing viewing and ventilation. Includes 1 chain lock with keeper and installation screws. Prefix U on factory number denotes new Defender Security packaging. Brass keepers and steel chain secures door while allowing viewing and ventilation. Includes 1 chain lock with keeper and installation screws. Prefix U on factory number denotes new Defender Security packaging. Steel keepers and chain. Secures door while allowing viewing and ventilation. Includes 1 chain lock with keeper and installation screws. Prefix U on factory number denotes new Defender Security packaging. 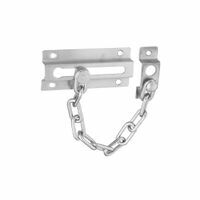 National Hardware Door Chain, Series: V807, Suitable For Use With: Wood or Metal Doors, Die Cast Zinc, Satin Chrome, For Residential and Apartments Solid brass keepers with steel chain secures door while allowing viewing and ventilation. (1) 5/8" x 2" keeper and (1) 3-5/16" x 1-3/8" keeper. Prefix U on factory number denotes new Defender Security packaging. Solid brass keepers with steel chain secures door while allowing viewing and ventilation. (1) 5/8" x 2" keeper and (1) 3-5/16" x 1-3/8" keeper. Prefix U on factory number denotes new Defender Security packaging. Solid brass keepers with steel chain secures door while allowing viewing and ventilation. (1) 5/8" x 2" keeper and (1) 3-5/16" x 1-3/8" keeper. Prefix U on factory number denotes new Defender Security packaging. Plated steel chain and diecast keepers secures door while allowing viewing and ventilation. Can be unlocked with key from outside or inside. Bolt slides into keyed mechanism to lock. Includes 1 chain lock, 2 keys, and installation screws. Prefix U on factory number denotes new Defender Security packaging.